After hosting a Memorial Day party on Sunday, Jane and I decided to take a break and visit one of our favorite places in Colorado, Cheesman Canyon. 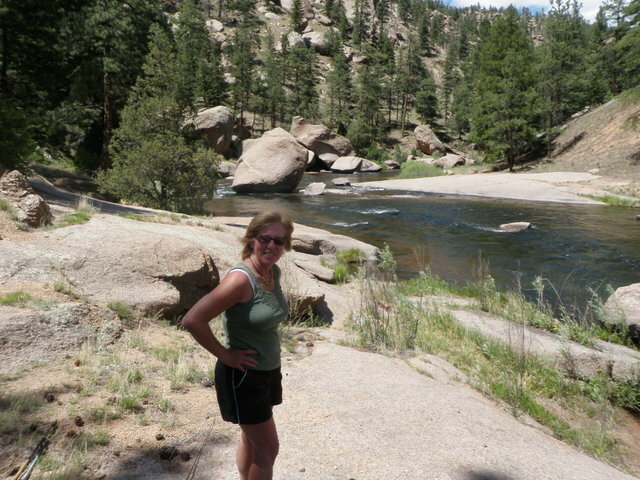 Cheesman Canyon can only be accessed by hiking on the Gill Trail for two to three miles, and it is a beautiful setting as the clear cold South Platte River cuts through a deep canyon with massive boulders and tall ponderosa pines. We packed our lunches, water and fishing and hiking gear and got off to a late start. As we descended to the South Platte drainage at Nighthawk and began driving along the river it was evident than a lot of folks were taking advantage of the 75 degree sunny day and the Memorial Day holiday. We couldn’t find a parking space at the Wigwam parking lot so circled back to the dirt road that crosses the Gill Trail and parked along the shoulder. I stashed all my fishing gear in my backpack as it was too warm to hike fully attired in chest waders. After a forty minute hike we found a small shaded spot on a large slanted rock next to the river just above Cows Crossing and munched our lunches. Leftover teriyaki chicken from the Sunday cookout was a tasty highlight. After lunch I rigged my Scott six weight, clipped on a split shot and knotted a green caddis larva and RS2 to my line. Jane found a thingamabobber in a small eddy next to our lunch rock, so I attached that as my strike indicator. I walked up the right bank twenty yards and began working the deep runs. Having failed to receive any response to my offerings I skipped around a huge boulder and found a nice deep spot where the current funneled around another large boulder and fanned against the boulder I circled. Here on the tenth drift along the edge of the faster current a nice fourteen inch rainbow grabbed the RS2 and I battled it to the gravel beach where I snapped a quick photo. I continued upstream to a very nice spot where the river widened and tumbled over some rocks creating a nice wide fan shaped riffle. On an early upstream cast something caused the strike indicator to dart and I set the hook and momentarily felt the weight of a fish. But just as quickly the fish was off, so I continued casting and after quite a few drifts fanned out over the top of the riffles I managed to hook and land a 12 inch rainbow that was also deceived by the small beadhead RS2. The next stretch featured some fisherman gymnastics as the steep canyon wall met the river and left only a single way to progress which involved contorting my body to squeeze through some small openings between the rocks. The area actually felt like a grotto with the large rocks and small openings and water running beneath me. On the other side of the boulder garden the river wasn’t as attractive and as I fished fairly quickly Jane appeared high on the trail above. She negotiated her way down the steep trail and met me at Rainbow Bend where we took some photos. The other side of rainbow bend featured a long pool and I covered this water with my nymph combo to no avail. I could see quite a few fish, but I suspect the splash of my indicator, line and split shot in the slower moving water was spooking them or at least alerting them to my presence. The green caddis larva had yet to produce any fish, so I decided to exchange it for an orange scud. 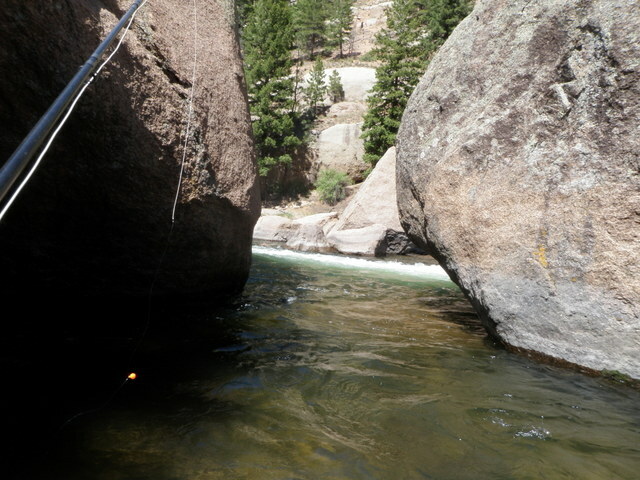 Orange scuds had been very effective on the South Platte in May when I used to fish it prior to the Heyman fire. At the top of the long pool there was a nice deep area where the riffles consolidated into a long deep run with deep water on both sides of the run. I fished this area thoroughly and as I was about to continue, I slung a long cast to the very top of the riffle where it dropped off into the deeper water along the main current. Wham! The indicator darted and I set the hook and I was attached to a large torpedo. Fairly quickly I received a glimpse of the large rainbow as it turned broadside in the current and shot downstream beyond my position a bit. I held tight and let it run, but when it paused I used the power of the six weight rod to turn it and maneuver it to the side. The rainbow then began a tactic of rolling on the line, but the orange scud held and I was able to scoop the big guy into my net. I let out a couple whoops of glee and as I carried my net to the gravel beach for a photo, Jane reappeared high on the trail above. She was amazed at the size of the fish as I held it with two hands for her to see. The fish extended beyond the opening of the net by two inches and carried impressive girth. I fished a bit longer but couldn’t create any success, so as the shadows began to extend I climbed up to the path and hiked back to meet Jane at our lunch base camp. We packed up all our belongings and made the long hike back out of the canyon to the car and returned to Denver. Dan and I made plans to fish after work on Friday, May 18 at Clear Creek. I planned a retro day and wore my old fishing shirt and took my Fenwick fiberglass fly rod out of mothballs. I was still waiting for my repaired Sage rod, so I let Dan use the Loomis five weight that he has become comfortable with, and I dusted off the old fiberglass since it is a short rod and better for small streams such as Clear Creek. A change of weather was rolling in to Denver and the skies were overcast most of our time on the stream. Dan met me at the Woolly Mammoth parking lot near the geologic cut out and we continued in my car to the parking lot at the start of the bike trail off the Hidden Valley exit of interstate 70. 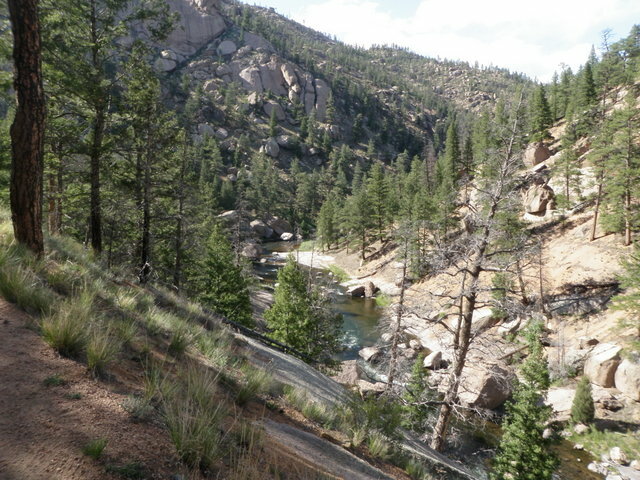 We hiked down the trail to the area where the creek widens near the large green Blackhawk road sign on I70. Dan waded across to the north bank and I worked up the south or left bank. I began fishing with a yellow Letort hopper and added a beadhead hares ear dropper approximately 2.5 feet below the hopper. Dan used the same flies with a shorter dropper. In short order Dan landed a small brown, but it took me half an hour or so to connect with my first fish. Over the next 1.5 hours we paralleled each other as we worked up along opposite banks. I landed one more fish in the last half hour. Dan landed a second fish as well but earlier in the two hour window of fishing. I probably failed to land an additional four or five fish after making a hook up. I attribute this to the soft nature of the fiberglass pole, and my failure to adjust my hook set technique to accomodate the increased flex deep into the trunk of the rod. Fishing during the last half hour was very challenging as there was a glare on the water in the dwindling light. I switched the top fly to a parachute hopper during this time to gain better visibility of the white wing, but this only marginally improved things. A cold front moved through Denver on Friday with overcast skies and steady rain. 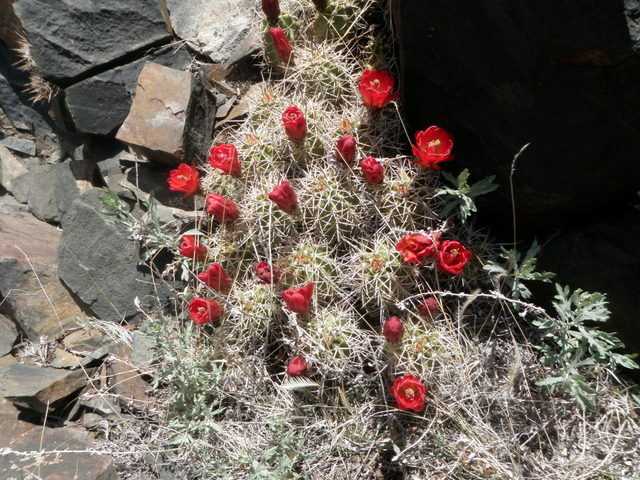 The weather forecast for Mothers’ Day weekend was highs in the low 60’s in Denver and additional precipitation. This is actually fairly typical weather for Colorado in May, but I’ve been spoiled by the many days of summer-like weather this spring. I wanted to go fishing on Saturday, but knew I’d have to stay at a lower elevation stream or risk fishing in temperatures in the 40’s and 50’s. The two lower elevation choices are the Arkansas River and the South Platte River. I read the fly shop reports and decided to make the Arkansas River my destination primarily because the flows on the South Platte below Cheesman Dam were 100, and that usually means tough fishing. 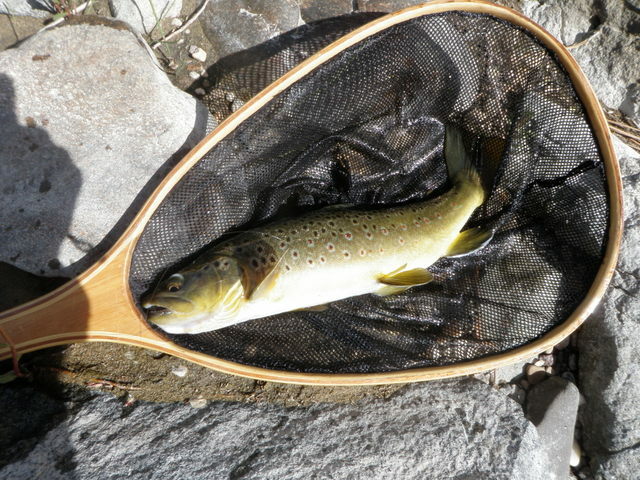 The ArkAngler report on the other hand was touting remaining caddis between Salida and Buena Vista. I didn’t bother getting off to an early start as I knew the air temperature would take a while to warm. I was correct on that assumption as there was snow covering the ground for my entire drive across South Park and the temperature stayed steadily at 29-30 degrees. 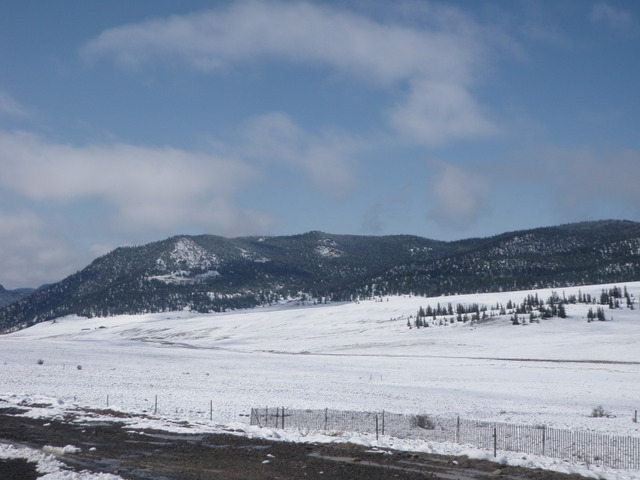 Fortunately as I dropped down from Trout Creek Pass to the Arkansas River valley the temperature rose to the high 40’s and low 50’s. Based on the ArkAnglers information about caddis above Salida, I decided to try a lease that I’d driven by many times but never stopped. A big green sign informed me that it was the Champion Lease. I bundled up in my fleece and windbreaker pullover and followed the path down to the river. The point where I entered the river and crossed was relatively unattractive compared to what I’m used to downstream on the Arkansas. It was wide with constant riffles and not many rocks or places that offered cover for fish. I worked up along the east bank in some marginal areas with a beadhead bright green caddis pupa and a beadhead RS2 with no action and I didn’t even spot any fish. Another fisherman arrived and crossed the river above me to my side, so when I came upon him I crossed back to the west side. He was left handed so I suppose that is why he preferred the side of the river I was on. Once I crossed back to the west side I worked my way up the left bank with the nymphs and couldn’t muster any indication of the presence of fish. I clipped off the caddis pupa and tied on a beadhead hares ear. Nothing came from that change out so I tried an Arkansas rubberlegs on top. This heavy fly certainly sank quickly to the bottom, but again no response. By 12:30 I’d covered quite a bit of water, some of which looked attractive, and hadn’t even seen a fish. This is highly unusual for the Arkansas River. As to the caddis, there was scant evidence that this bug even lived in this stretch of the Arkansas. I clipped my fly to the rod guide and decided to walk back to the car and move to another location. I could go upstream to Buena Vista near the kayak area or head further down to my favorite spot below Salida. As I was facing a skunking, I elected the latter as I had confidence I could pound up a fish or two there. 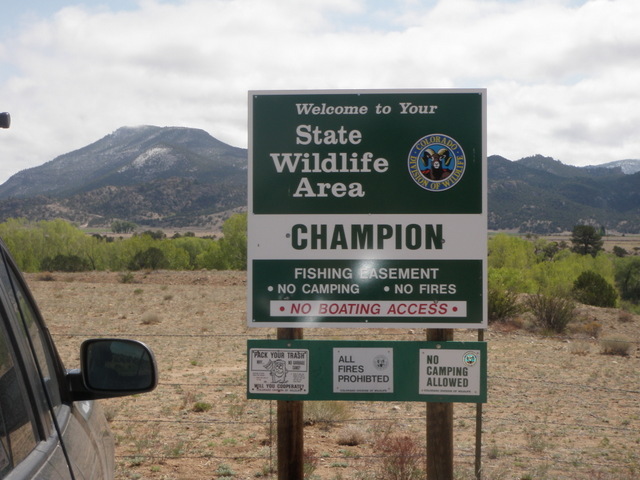 By the time I drove to the Chafee – Fremont county line and ate my lunch on the high rock perch as is my custom, it was 1:30 when I resumed fishing. I crossed the long pool at the tail and walked up along the north bank beyond the white water stretch at the top of the pool. I replaced the stonefly nymph with a duke nymph hoping the fish would remember egg laying adult caddis. Below the duke I kept a RS2 and hoped that some BWO activity would kick in. I fished the nymphs hard for an hour or so and covered a fair amount of water that I knew held fish, but had only a couple sub-six inch browns that weren’t counters. In frustration I decided to go with a hopper/dropper and see if I could attract some bank dwellers to opportunistically feed. First I tied on a yellow Charlie Boy hopper and added a beadhead hares ear and picked up two more tiny browns. The Charlie Boy wasn’t attracting any fish and tended to sink when the deer hair became water logged so I switched to a Chernobyl ant and then added a RS2 below the BHHE. Concurrent with this change some big gray clouds blocked the sun and the breeze kicked up a bit and I spotted one or two tiny BWO’s on the surface. This all occurred at around 3PM and I finally connected and landed a 10 inch brown. I’ve never been so pleased to land a ten inch fish. 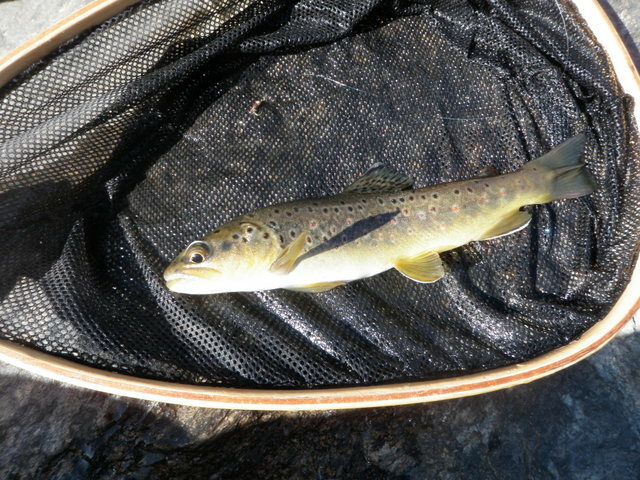 But this brown alerted me to the fact that fish were beginning to tune into the BWO nymphs. 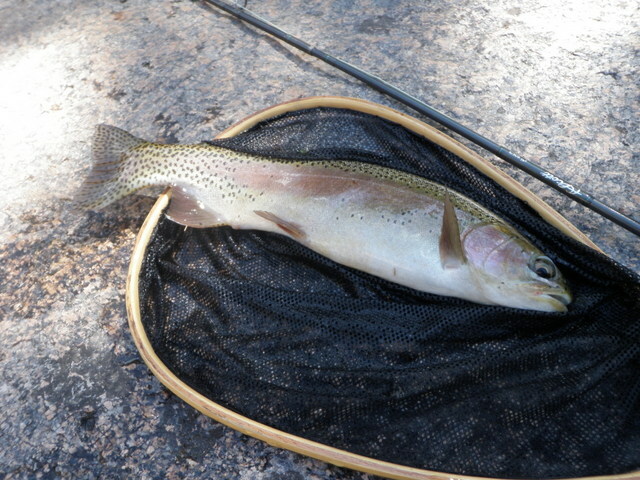 Between 3 and 4PM the fish became active and I landed five more trout, two rainbows and three browns. One of the rainbows was a nice 14 inch fish that put up quite a battle even against the sturdy six weight Scott that I was wielding. Of the six fish I landed on the day, five were fooled by the RS2 and one was attracted to the duke nymph. As quickly as the action heated up at 3, it shut down at 4. I continued fishing the same flies in the same manner in some very attractive runs and pockets along the north bank, but once again a case of lockjaw had overcome the fish. I decided to quit at five and make the return trip very happy knowing that I’d avoided a skunking and salvaged six decent fish. Unfortunately I experienced 4.5 hours of nothing for the sake of one hour of hot action. Was I padding my numbers? 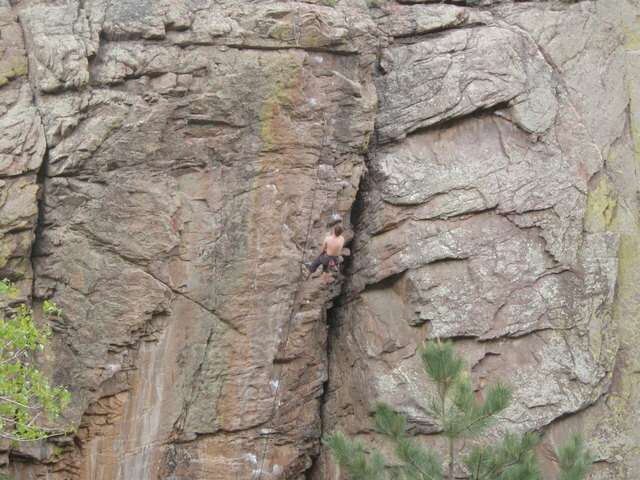 Perhaps a bit, but I really enjoyed my evening on Clear Creek on Wednesday, May 9. 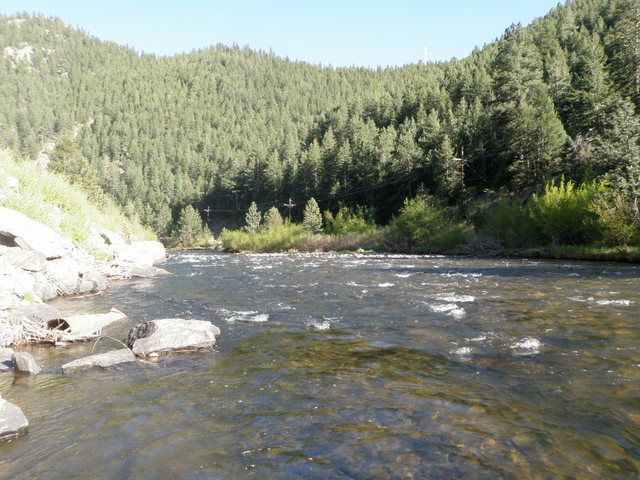 Making the relatively short 45 minute drive to Clear Creek just east of Idaho Springs and fishing into the evening when the sun dropped behind the mountains and the air cooled reminded me of evening fishing in Pennsylvania when I began fly fishing. I threw all my gear in the back of the Santa Fe when I got home from work and departed for the mountains. 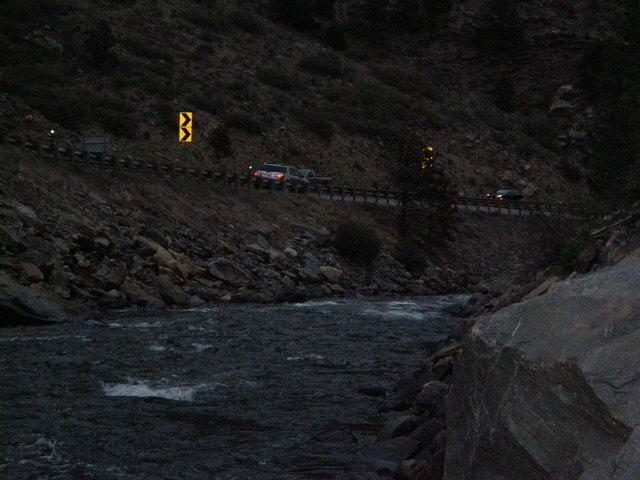 I had to maneuver through some heavy traffic on I70, but still managed to arrive at Clear Creek by 5:00PM. Initially I planned to fish upstream from the Hidden Valley exit, but there were road construction workers up ahead on the road, so I decided to turn around and park at the bike path trailhead and walk downstream. I hiked down the path beyond my previous furthest point and entered where Clear Creek fans out from its normal narrow chute. I tied a nice dark olive deer hair caddis to my line and began casting in some very attractive water at the tail of a run over moderately deep water. There were caddis in the air, so I was hoping to get some action on top before resorting to nymphs. However, I covered the nice twenty foot run with no signs of interest from any fish, and the fly was difficult to see in the sun glare and the swirly water, so I elected to tie on the tried and true yellow Letort hopper with a beadhead hares ear nymph dropper. It didn’t take long before I hooked and landed a small brown on the hares ear as I moved up above the long run to some shallower pocket water. At this point the stream was shallow enough that I could cross, and I concluded that the north or right side of the stream would remain in the sun longer, so I made the move and worked my way up along the right/north bank. For the remainder of the evening I scrambled over the rock embankment and popped casts to the likely deep slower moving pockets along the north bank. I landed an additional fourteen brown trout mostly ranging in size between seven and ten inches with perhaps two or three stretching the tape to eleven inches. I caught a few no counters and had numerous long distance releases and refusals. The key was to keep moving and not dwell on spots where a fish showed but wouldn’t take. As time passed I also found that the fish liked to hit the trailing nymph as I lifted the rod to make a new cast. Of the fifteen fish landed during the evening two inhaled the hopper and the others bit the hares ear. By 7:30 the air had chilled to the point that my hands were cold, and the sun disappeared behind the mountains to the west. I decided to scramble up the steep bank to the shoulder of interstate 70 and walk back to a point where I could cross and return to the car. Yes, the fish were small, but I enjoyed my evening and remembered fishing during cool spring evenings in Pennsylvania on the Monocacy Creek and Little Lehigh Creek. I’ll do it again if the snowmelt holds off. After working four days during the first week of May, I was looking for opportunities to fish on Saturday before run off kicked up in a major way. Jane was up for joining me on a trip depending on the destination. 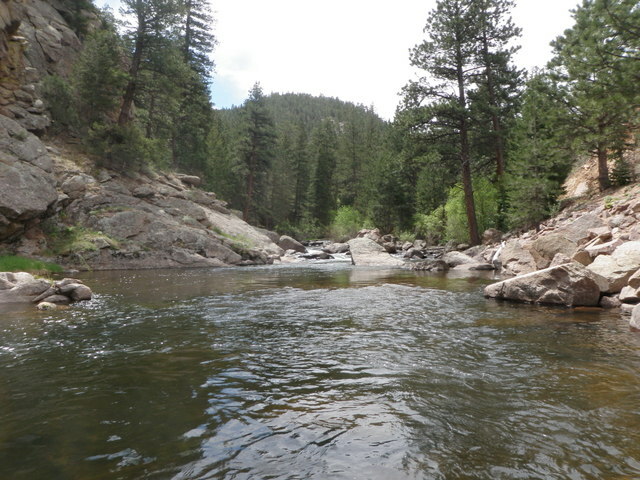 I checked out the flows and reports on Clear Creek, the North Fork of the St. Vrain below Buttonrock Reservoir, the South Platte at Deckers, and the Big Thompson below Lake Estes. The flows looked nearly ideal on the St. Vrain and the report from Rocky Mountain Anglers in Boulder was favorable, so we decided to make this our location for the day. Accessing the stretch of water below Buttonrock Dam involves a 30 minute hike on a dirt road that runs along the stream. Bikes and cars are prohibited, so this was a nice location for Jane to do some hiking. We arrived at the parking lot by 9:45 and after a nice hike on the gradually graded road, I was in the water fishing by 10:30AM. We stashed our lunch and a stadium seat for Jane by some rocks between the road and the stream, and I walked back down the road beyond the spot where a second road cuts off to the reservoir. Jane meanwhile continued her hike to the dam and lake above. I began with a yellow Charlie Boy hopper for visibility and good floatation and dangled a beadhead hares ear nymph 2.5 feet below the bend of the hopper. I methodically began working my way upstream and covered the likely holding locations. It didn’t take long before the hopper dipped and I landed my first small brown trout on the day. This continued until noon when I arrived at the series of nice deep pools across from where we stashed our lunch. I had landed five trout, four browns and one glimmering rainbow, and most of the fish came from obscure small pockets along the left bank as I faced upstream. One of the browns actually inhaled the large foam hopper. Jane had returned from her hike and was sitting along the road high above the stream. At the tail of the lower pool I landed a ten inch brown and watched a refusal in the current seam. I moved up a bit and cast to the top of the current and let the hopper drift downstream to the tail. After a five foot drift the hopper dipped and I set the hook and felt the temporary weight of a fish. Unfortunately the weight disappeared as quickly as it began, and I was disappointed to have flies back at my feet with no reward. My focus was renewed by the near miss and I climbed some rocks to the middle pool and made some drifts through the center and spotted two refusals to the hopper. A trend was developing with hopper refusals, and I decided to switch to nymphs for this nice deep run after lunch. I climbed up the bank and joined Jane for lunch. She had hiked to the lake above the dam and observed quite a few fishermen and showed me some photos she’d snapped with her iPhone. The water level in the dam was already eight to ten feet below the high water line on the rocks. The lake had opened for fishing on May 1, and she spoke to a pair of fishermen who had caught one trout each. While we ate our lunches a man walked by with his two golden retrievers, and of course the dogs wanted to jump in the pool I had targeted for nymphs after lunch. After they jumped in and thrashed around a bit, he added to the mayhem by tossing some sticks and stones in the water. After this disturbance I elected to fish the smaller top pool in the series and continue on my way upstream. I kept the hopper dropper on but added a size 22 beadhead RS2 below the BHHE as I began to observe a few small mayflies in the air. The sky was partly cloudy for the most part over the remainder of the afternoon. I’d fished for half an hour or so with no action, and I felt that I should be catching some fish, and I began seeing a few more BWO’s in the air, so I decided to try an indicator with split shot and two flies including the RS2. The top fly of the two was a bright green caddis pupa. Between 2 and 2:30 I approached a nice long run toward the middle of the river where the smooth slick fanned out to a nice slower moving pocket of moderate depth over a rocky bottom. On the first drift I observed a refusal to my red strike indicator. This usually happens a couple times during a season of fishing. I put some more nice drifts through the attractive water and witnessed a pause in the indicator and set the hook and this time I was attached to a decent fish. As I played the fish I could feel the fish roll on top of the line and then felt the hook slip, but I was still attached to the fish. Apparently the fish had slipped the top fly but then got foul hooked by the trailing RS2. When I finally netted the fish I discovered a 15 inch lake trout. I inspected my flies and flicked them to the top of the long pocket and once again saw a pause and set the hook. This time I played a nice chunky rainbow to my net and photographed it. 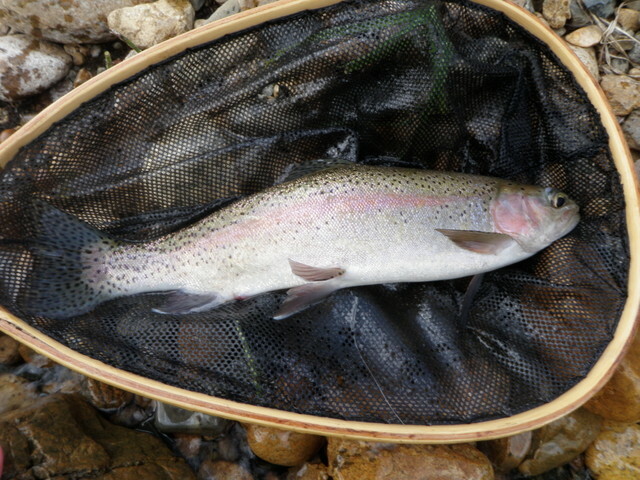 The rainbow had fallen for the bright green caddis pupa and represented the nicest fish on the day. Could this spot hold more fish? This period represented the most intense BWO hatching time, as I observed 5-10 over a half hour period. Why weren’t the fish going for the RS2 instead of the bright green caddis? I made a couple more casts and tried the jigging action that worked on the Arkansas with periodic quick tip lifts as the flies tumbled through the sweet spot and I was rewarded with a hit and felt the throbbing of my rod. This fish cleared the surface of the water and I could see that it was brown, but for some reason after it re-entered the water it came free. I brought my flies in to inspect and realized that the line broke at the knot just below the split shot, so I assume it weakened with the fishing and occasional snags on sticks and rocks. I’d now hooked a rainbow, a lake trout and a brown in this relatively obscure deep slot. After some additional unsuccessful probing of my hot spot I moved on up the stream and managed to land one more small brown on the bright green caddis pupa. The water between my hot spot and the settling pool below the dam was largely unattractive with fast white water and small pockets that didn’t hold fish. I reached the settling pool and hiked back down the road and found Jane in her stadium seat reading her Kindle. I dropped down the nice run that had been disturbed by the dogs and ran my nymphs through the sweet spot. I did manage to have a momentary hookup at the tail of the run as I applied the lifting action to the flies, but that was the extent of the action. Jane was ready to pack it up and return to the car, so I called it a day at 3:15 or so. 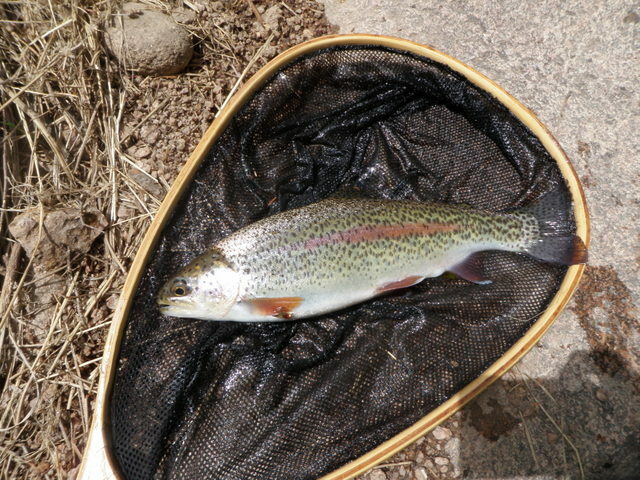 Following my spectacular outing on the Arkansas River on April 24, I began following the fishing reports of the fly shops in Salida (www.ArkAnglers.com) and Canon City (www.royalgorgeanglers.com). 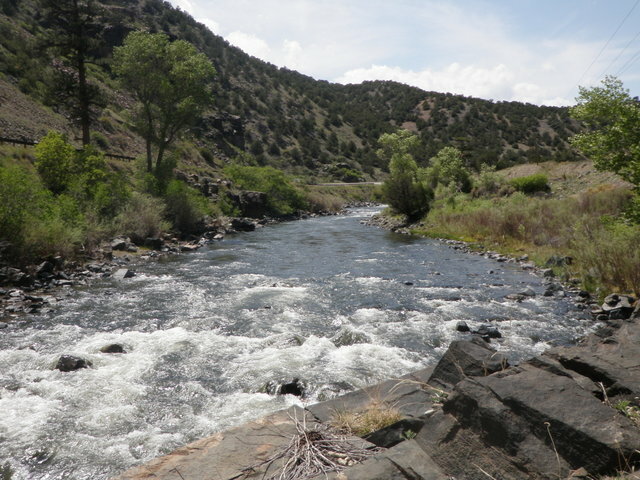 Both web sites indicated that the cool weather over the weekend stalled the progression of the caddis hatch around Cotopaxi, but the warmer weather this week was expected to prod the hatch to move up the river toward Salida. I decided to make another attempt to hit the leading edge of the hatch on Wednesday. Temperatures were projected to peak at the mid-70’s on Wednesday so I once again got off to an early start around 6:30AM. 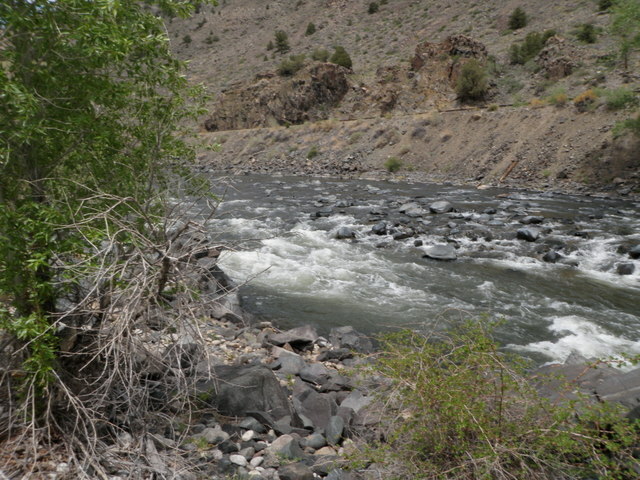 I arrived at the river by 9:30 and parked at the Fremont – County line pullout as I had done the previous Tuesday. 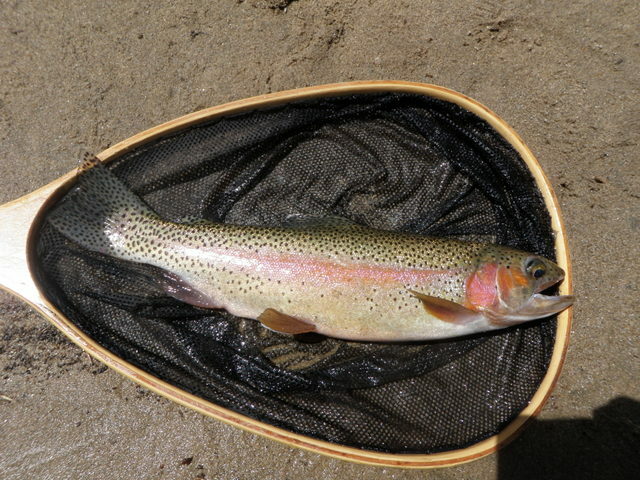 The river was in prime condition with great clarity and the flows appeared to be comparable to the previous week. What would a trip to the Arkansas River be without a bit of hardship however? 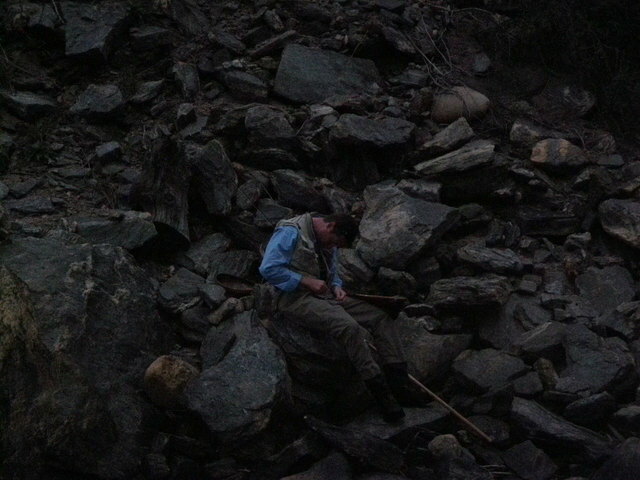 Before I climbed into my waders I walked down the crude concrete steps and my shoes rolled on some round gravel. As I fell backward I used my left hand to brace my fall and felt a sharp stinging sensation. I looked at my hand and realized the rough concrete sliced off a couple layers of skin in a 1/2″ square area just beneath the little finger on my left hand. I returned to the car and cleaned the fresh wound with some antibacterial wipes and found two small Band-Aids in the first aid kit in the center console. Fortunately it was my left hand, and I wasn’t going to let this ruin my day of fishing. I prepared to fish and waded across the river at the tail of the long pool, but instead hiking down the railroad tracks to the island as I usually do, I hiked up the tracks 100 yards or so to the next nice water above the long pool. I set up my Scott six weight rod with a Thingamabobber, split shot, beadhead bright green caddis, and beadhead RS2. It didn’t take long before I landed two nine inch browns on the RS2. I moved up along the north bank and probed the nice pockets and soft shelfs of moderate depth with my pair of flies. Just when I thought I was going to land all smaller fish, I hooked and landed a beefy 15″ brown and photographed it. Between 10AM and 11:30 when I paused for lunch I landed nine decent fish with all but one or two attacking the RS2. 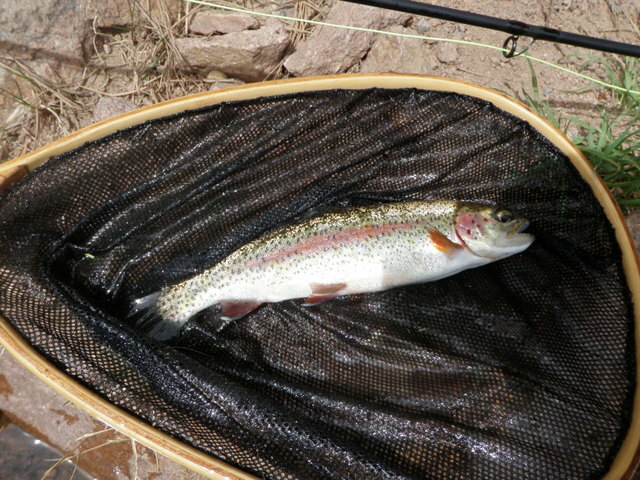 The Arkansas fish in this stretch below Salida were still in tune with the BWO nymph imitations. The fishing slowed a bit and I encountered a pair of fisherman above me, so I elected to return to the car and eat my lunch. I sat on my usual perch above the long pool, but didn’t observe any fish this time. After finishing my lunch I decided to drive up the highway toward Salida a bit and parked .5 miles west just beyond a large rock. There was a SUV parked on the east side of the rock and several fishermen were in the lower pocket water that I was thinking of fishing. I remained flexible and began fishing 30 yards or so above the most upstream of the group of fishermen in a nice run where I’d spotted fish on previous trips. On the third drift at the head of the nice run the indicator dipped and I hooked, played and eventually landed a beautiful 15 inch rainbow. The hard fighter made several strong runs to the edge of the current before I could steer it back to my net. Right along the edge of some large rocks just above the rainbow run, I spotted a fish making a quick rise and sure enough on the second drift tight to the rocks a nice brown took the bright green caddis on the lift. I was getting pretty optimistic about the prospects of the afternoon. A bit further upstream I landed a smaller brown to put my count on the day at 12. But the fishing would slow considerably at this point. The sky was clear blue and now the air had warmed to the seventies. I continued working the nymphs until I reached a short pocket where I observed a decent rainbow reveal itself with a slow sipping rise. 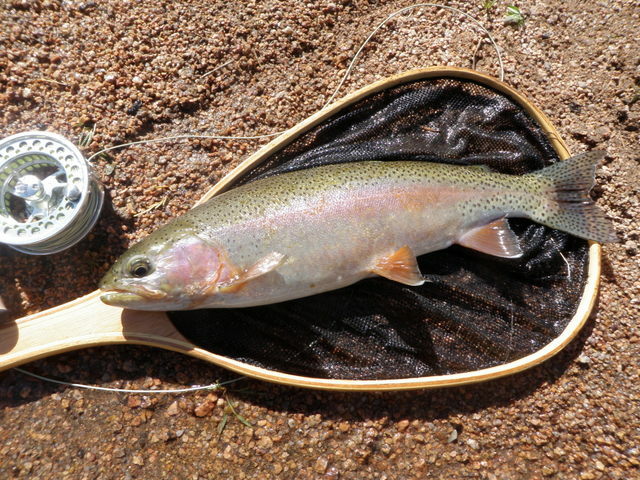 I tried sweeping my flies and jigging them past the rainbow but received no response. Finally I relented and removed my nymph fishing setup, and tied on a CDC BWO to entice the rainbow. Unfortunately this got ignored as well and after a few casts I could no longer spot the fish. What should I do now? I didn’t want to tie on the nymphs and crimp on split shot and add an indicator again after having just removed everything, but I had no confidence in prospecting the big water of the Arkansas with a tiny BWO imitation. I decided to tie on a size 12 stimulator/caddis with a light olive body and then add the RS2 dropper a foot beneath the indicator fly. I worked this combination along the bank in some attractive water for twenty minutes or so and foul hooked one fish that apparently refused the caddis but got nailed by the trailing RS2. I finally decided that the two fly nymph combination was the most effective approach and returned to it. I picked up a couple fish, one on the bright green caddis and one on the RS2 and then skipped around some big deep holes and came upon a stretch of pocket water. The river at this point was wide, so I could wade out a bit and hit some short pockets in the middle of the river. Some clouds rolled in and the breeze kicked up a bit and suddenly the fish were attacking the RS2 again. I moved quickly from small pocket to small pocket and tucked upstream casts behind the large boulders at the head of each pocket and began hooking fish as I lifted my flies at the tail. I landed five browns of moderate size using this technique with one taking the caddis pupa and the others falling for the RS2. I continued to be amazed at how effective the tiny RS2 continued to be throughout the entire day. I experienced quite a few momentary hook ups in this stretch in addition to the five fish I successfully landed. When I reached the point where a tiny feeder stream entered the river, I was above the pocket stretch, and wasn’t experiencing any action so I changed the bright green pupa for a duke nymph as my top fly. For the last hour I fished the duke/RS2 combination and had three hook ups that felt like nice fish, but I failed to land them. The RS2 is a very effective fly, but because of the diminutive size 22 hook, it is difficult to keep fish attached long enough to land. I worked hard to land a twentieth fish, but after losing three and with the sun back in the clear blue sky, I decided to call it a day and hiked back down the highway to the car and prepared for the 2 hour and 45 minute return trip.